The Easter holidays are nearly upon us already, which means that parents and students alike will soon be scrambling around, trying to find enough activities to keep themselves and the kids entertained over the vacation. 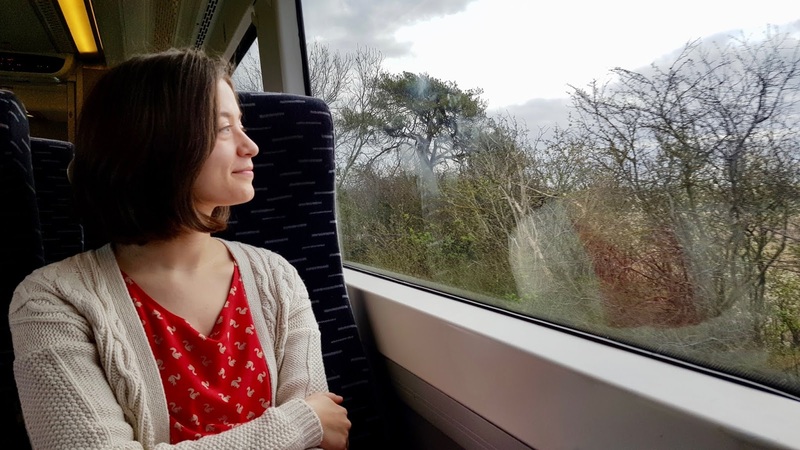 To inspire you with a few ideas for how to spend the Easter hols in the East of England, I was kindly sent on a #railadventure with Greater Anglia to showcase days out by train. Last summer, you may remember that my sister and I enjoyed an exciting rail adventure to the Broads, where we sailed down the beautiful waterways of Norfolk on a river cruise, so I was very keen to repeat the experience. When offered a choice of destinations across the Anglia region, Bury St Edmunds was first on my list. Today I'll be sharing all of the places in the pretty market town that I visited on my rail adventure, including food and drink recommendations, top tips for sightseeing, and activities for those young and old. Let's get started! Since I grew up in the Suffolk countryside, I am more than a little bit biased when I tell you that it is one of the best places to visit in East Anglia. I'm not the only person to fall in love with the county, however. Suffolk's beautiful landscapes have inspired artists such as John Constable and even Ed Sheerhan, who wrote his hit song Castle On The Hill about Framlingham Castle in the Suffolk town where he grew up. The county is also home to some truly picturesque villages worthy of a fairytale, including the thatched roofs and Tudor frontages of Lavenham, Sudbury, and Hadleigh. If you're looking for a beach to visit, Suffolk has those in abundance too. I have many childhood memories of strolling along the sea wall at Aldeburgh beach, taking my toy yacht for a sail on the boating lake. Suffolk really does have so much to offer. My rail adventure to Bury St Edmunds began in Cambridge, famous for being Britain's Cycle City. To enable the city's cyclists to leave their bikes in a safe place whilst exploring East Anglia by rail, Greater Anglia operate the station's Cycle Point, the UK's first multi-storey cycle park. The Cycle Point is free to use and I found it to be very convenient. The first floor of the bike park is very crowded and could perhaps do with a little maintenance to remove some of the abandoned bicycles, but the second floor provided a lot more space and we were able to lock up and go easily. 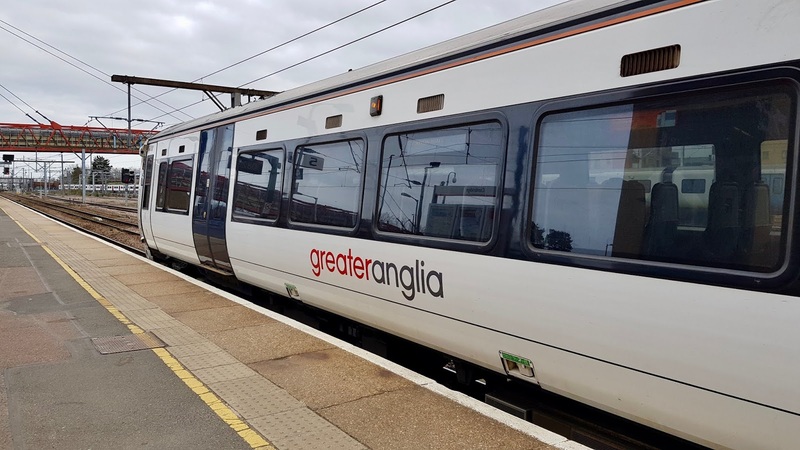 While rail travel doesn't always have a reputation for being cheap, Greater Anglia have many attractive offers running throughout the Easter holidays to tempt you into travelling by train. Accompanied children can travel for just £2 return, an amazing fare which is valid for any off-peak journey on the Greater Anglia network. You don't need to book this in advance either, you can just turn up and buy your discounted tickets from the station on the day. Greater Anglia offers great value off-peak fares with 2-for-1 on attractions in London and East Anglia. If you book in advance, tickets from Norwich to London are available at just £10, Cambridge to London at £7 and Southend to London just £5 one way. Not bad if you want to explore the Anglia region or the capital! When boarding the service from Cambridge to Bury St Edmunds, I was very happy to find myself in one of Greater Anglia's newly refurbished trains, work on which was carried out in 2018. The train was clean, smart and well-maintained with comfortable seats, charging points for laptops and phones, new wall panels, and fresh carpet. This made for a pleasant, relaxed travelling experience. When travelling by train, the adventure starts as soon as you board! I really enjoyed being able to take in the views of the glorious Suffolk countryside during my train journey, something that I wouldn't have been able to do if I were driving. Our train route took us past the Newmarket stables and we got to see some beautiful horses out for a hack whilst on the way to Bury St Edmunds. Little things like this make a journey all the more memorable. 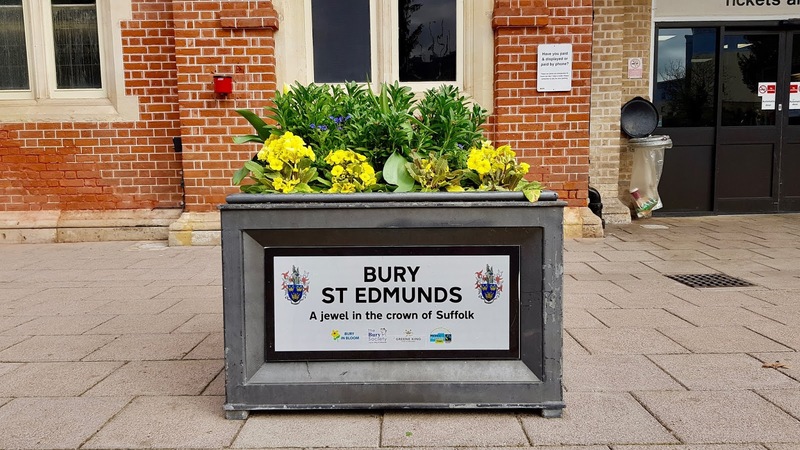 Having just waxed lyrical about visiting the county of Suffolk as a whole, I should probably dedicate a few words to why Bury St Edmunds is particularly worthy of your attention. 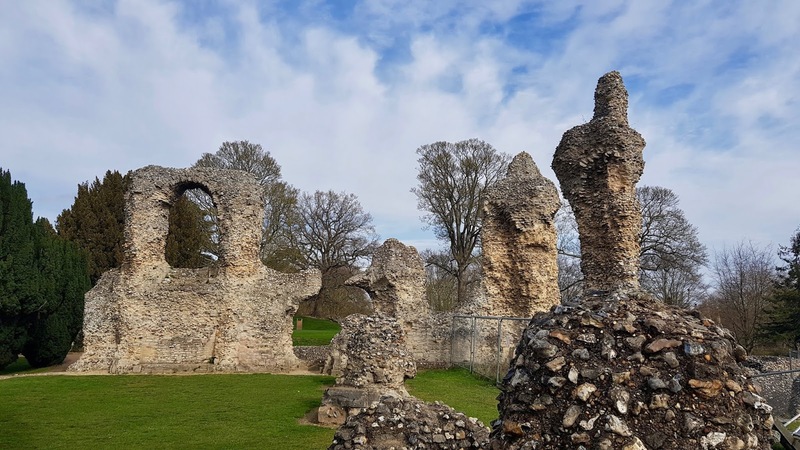 Regularly described as a jewel in the crown of Suffolk by both locals and tourists alike, Bury St Edmunds has a remarkable history and a bustling vibe that make for an interesting and enjoyable visit. I'll be covering the main highlights of the town just a little way down the page but to whet your appetite, here are four great reasons to book your train tickets to Bury ASAP. Perfect for fans of Oliver Twist or A Christmas Carol, Bury St Edmunds boasts a Georgian coaching inn frequented by Charles Dickens on his trips to the town. The Angel Inn, now a boutique hotel located opposite the main entrance to the historic Abbey Gardens, still offers guests the chance to stay in Dickens' favourite four-poster bed! Another historic highlight is Bury St Edmund's 200-year-old Theatre Royal, first built in 1819. It is the only working Regency playhouse to still exist in the UK, offering pantomimes every Christmas and regular tours for curious theatre buffs. The venue was restored to its pre-Victorian glory in 2007 and is a Grade 1 listed building, lovingly looked after National Trust. If you're more interested in watching the big screen, you can also head along to the Abbeygate Cinema, an independent movie theatre showing an eclectic mix of arthouse, independent and quality mainstream films. They show not just motion pictures but recordings from the Royal Opera House, National Theatre, and Royal Shakespeare Company - something for every culture vulture! When was the last time you visited a local market? If that question has really got you thinking, a visit to Bury St Edmunds could be just the thing to refresh your memory of how charming country markets can be. With everything from fresh flowers to homemade cakes and handicrafts on offer, Bury's twice-weekly market will give you the perfect opportunity to pick up something that little bit different. Visit on a Wednesday or a Saturday to make the most of it. While we're on the subject of shopping, something that stuck me as soon as I entered Bury St Edmunds town centre was just how lively the high street and market centre remain, even today. Almost every night on the news you hear about how high streets across the country are in crisis, with online giants such as Amazon driving shoppers away from their local towns. The only successful business ventures in many town centres these days seem to be big chains - Starbucks, McDonalds and Primark seem to be picking up while independent stores are flailing. Nothing could be further from the truth in Bury St Edmunds. 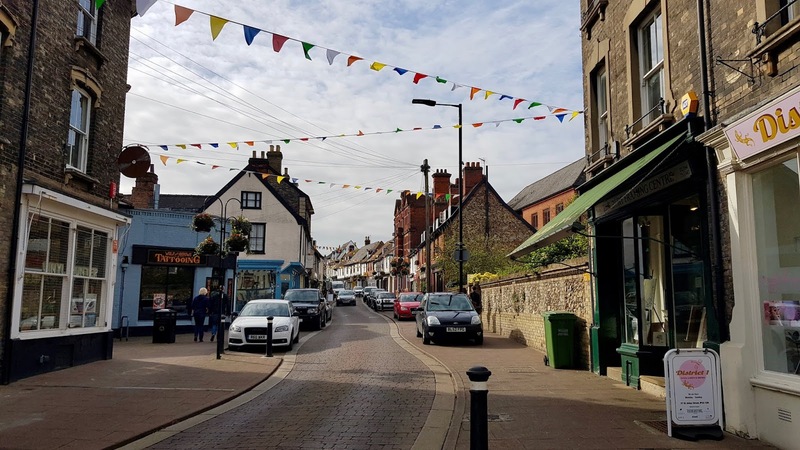 St Johns Street, which leads from the train station to the town centre, is packed with small businesses (everything from florists to bakers and bike shops to jewellers) that all seem to be thriving. There are very few boarded up shops which makes a nice change from the many empty storefronts on the main streets of cities like Oxford at the moment. The liveliness of Bury's high street doesn't make the town feel crowded or overly bustling, however. Although our visit took place on a busy Saturday, we were never jostled around or rushed anywhere. Bury St Edmunds retains its rural, sleepy atmosphere. Just a stone's throw away from the shops of the town centre, you will find the historic Abbey Gardens. As a huge fan of Tudor history, I loved visiting the remains of the Benedictine Abbey, destroyed by Henry VIII in 1539 as part of his nationwide dissolution of the monasteries. After the complex was largely demolished under King Henry, many of the remains were pillaged for building materials, but some major sections such as the crypt and the walls of the old abbot's house can still be seen today. Many features survive in incredible condition, such as the 14th century Great Gate through which you enter the Gardens. The whole area is very well manicured with beautiful flowerbeds and even an aviary. 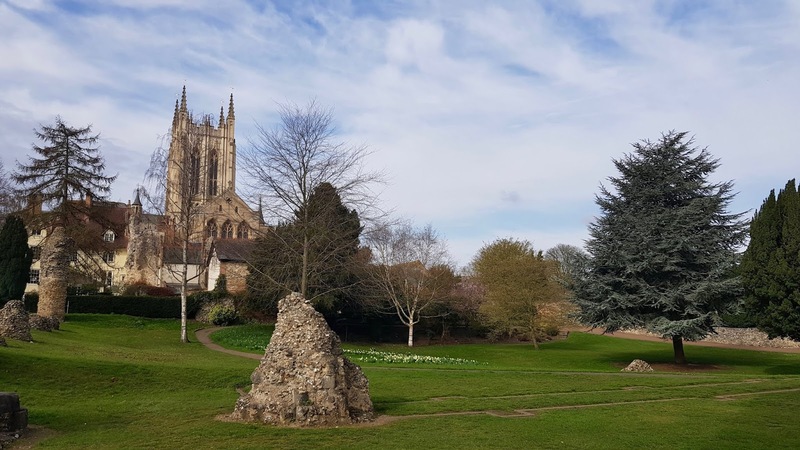 Whether you're more interested in taking in the history or just letting the kids burn off some steam in the little playground adjacent to the ruins, the Abbey Gardens provide a lovely place to spend a sunny afternoon. 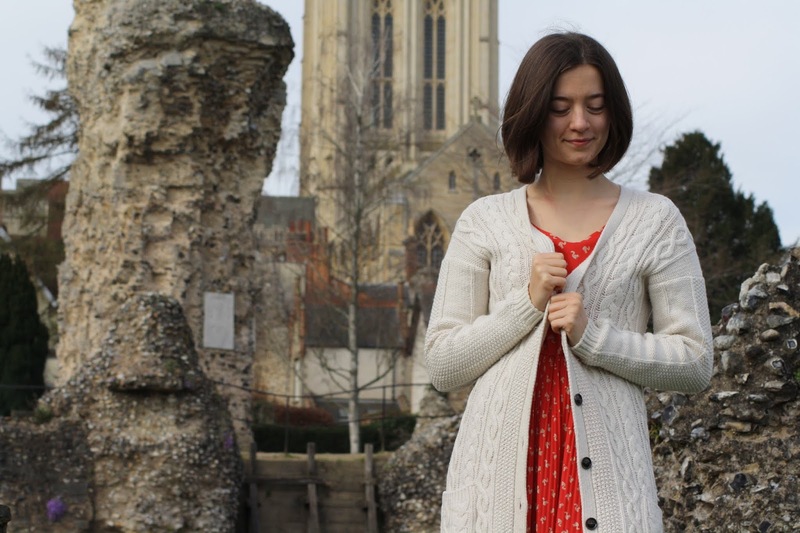 Another place providing entertainment for kids and adults alike is St Edmundsbury Cathedral. As Suffolk's only cathedral, the place is steeped in history as it has been the site of pilgrimage for over 1,000 years. The newly restored vaulted ceiling is truly stunning with its colourful depictions of the coats of arms belonging to all church dioceses in England (including one blank one from when a diocese didn't submit their design on time!). A cleverly installed mirror on the ground allows you to take a closer look at the vibrant ceiling which was restored by a local Suffolk firm in 2009. For the younger ones, the cathedral also has a big draw because of the Lego replica of the building currently under construction inside! Visitors can play a role in building up the Lego model, using the bricks and instructions provided. Volunteers in the cathedral are aiming to raise £200,000 for the cathedral's upkeep through the Lego building project, £1 for every Lego brick used to construct the model. Having taken in the scenic town and the history of beautiful Bury, it was time for something a little more energetic! 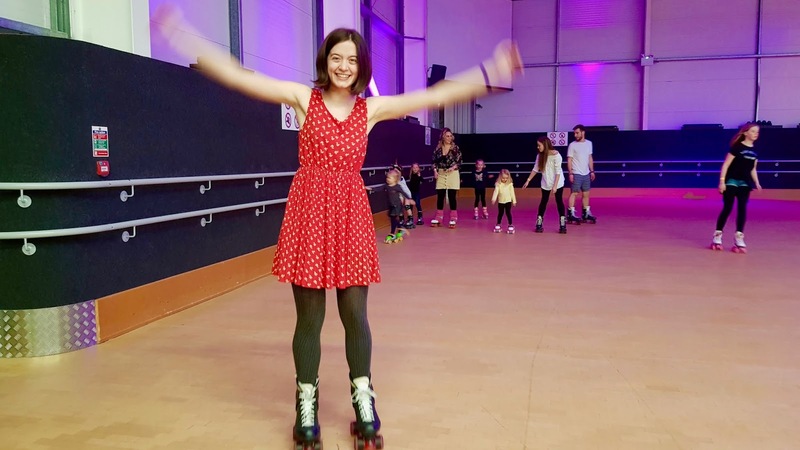 I was lucky enough to be gifted tickets to the Saturday SkateLove session at CurveMotion, a pioneering indoor activity venue offering fun for all the family in the form of roller skating, soft play, and mega slides. SkateLove was an open session for all ages and abilities, ideal for someone like me who had never set foot on a pair of roller-skates before. I will openly admit to being a total disaster during my first forays onto the rink. The first thing I did after putting the skates on was roll backwards into a table and end up on my backside. Ouch. However, I did (slowly but surely) get the hang of it and was soon making my way around the rink, albeit a little unsteadily. One of the great things about the SkateLove session was the atmosphere. Music and disco lights made you feel like you were at a party, with the soundtrack containing everything from cheesy 90's pop, cheesy 00's pop and cheesy pop from the current charts (who doesn't love a bit of Ariana Grande!). Every hour, games such as roller-skating dodgeball were hosted by CurveMotion staff to keep everyone entertained! Kids and grownups alike seemed to be having a great time. If the kids tired of skating, there was also plenty to keep them happy in the soft play area. The CurveMotion play frame is the biggest in East Anglia and even has a vertical drop slide - I found myself wishing that I was 10 years old again so that I could have a go myself! If you're a novice skater like me, not owning any roller-skating equipment needn't put you off. 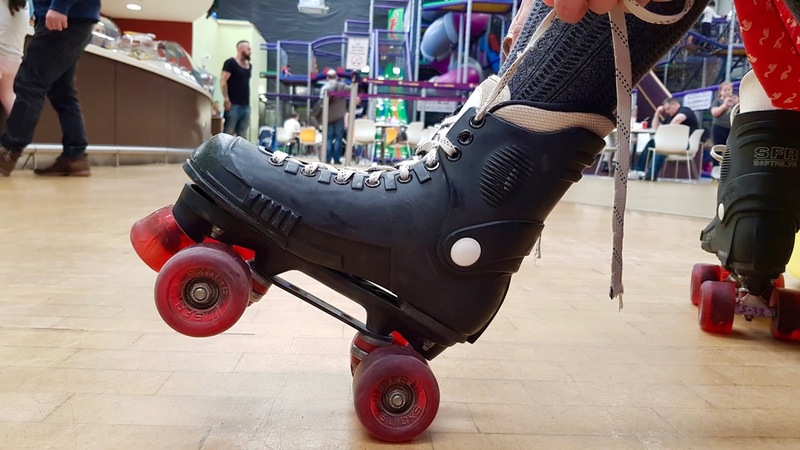 CurveMotion offer hire of quad skates for all ages and sizes, including adjustable toddler skates for the little ones, although you can bring along your own skates or roller blades if you already have them. Safety equipment such as helmets, wrist guards, elbow guards, and knee pads are also available for use, completely free of charge. You can stow away your valuables as you skate in the lockers adjacent to the rink. These require a £1 coin to lock but this is refundable. 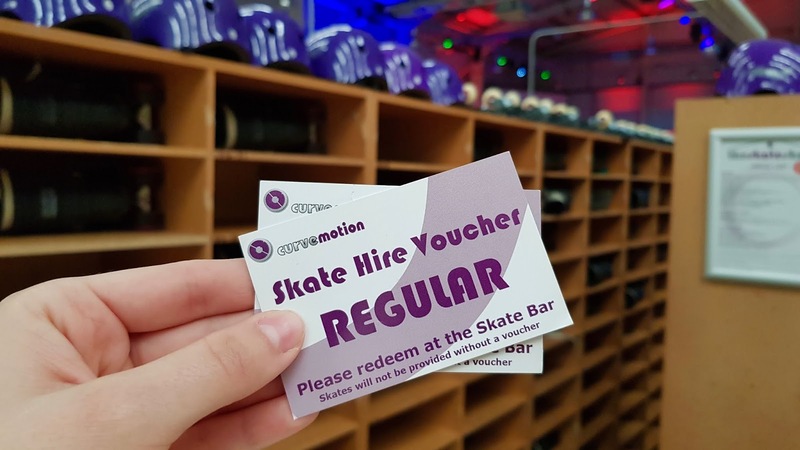 As for the other costs incurred by a day's skating, entrance to the rink for a minimum 3 hour session (longer at off-peak times) will set you back £8.95 as an adult, with skate hire being an additional £2.95 on top. The cost for children is obviously cheaper and the full price list can be found on the CurveMotion website. One important thing to note is that a spectator fee of £2 is required for non-participating parents bringing their children to skate or play. Importantly for the grown-ups, CurveMotion also has a bistro serving coffees, baguettes, paninis, burgers and more. Another key area that impressed me were the toilets. Very often at venues such as this which have a young audience, you find the toilets to be a bit of a mess and less than desirable to use. However, at CurveMotion I was really happy to find spotlessly clean facilities. They were obviously checked regularly and maintained well. One last shoutout also has to go to CurveMotion staff members Neil and Matt, who were manning the rink to ensure that everyone was skating safely during my visit. Both of them stopped to chat to me and give me tips on improving my skating technique when I was struggling, and both of them should really be commended on providing great service. 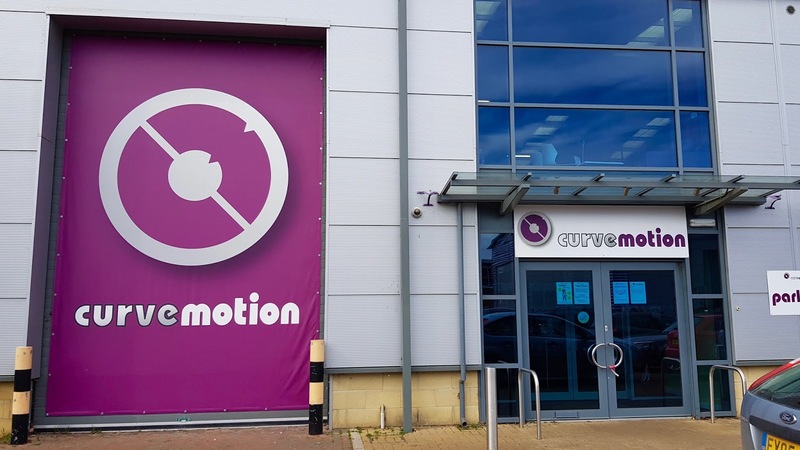 Overall, I would highly recommend a visit to CurveMotion as an Easter holiday activity. Having spent two consecutive summers working on an archaeological excavation on the coast of Greece, I feel like I know my Greek food. 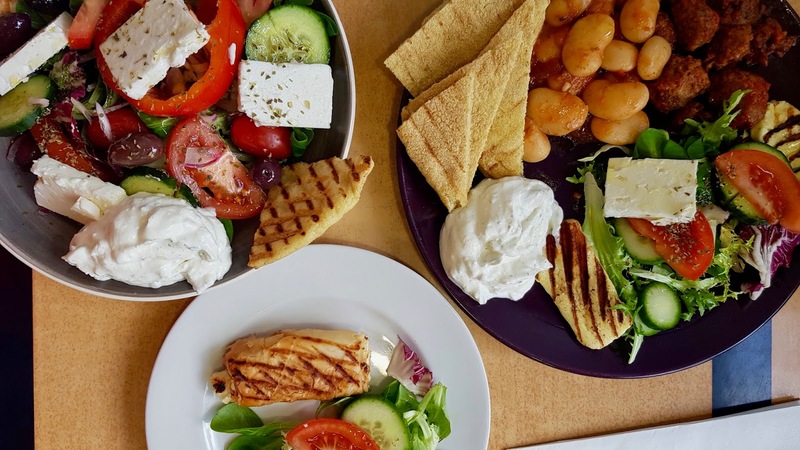 I am a huge fan of souvlaki and spanakopita but I rarely eat at Greek restaurants in the UK, simply because I usually don't find them to be a patch on real Greek food. However, during my visit to Bury St Edmunds, I decided to give the authentic-looking Cafe Kottani a go. Thankfully, I wasn't disappointed! From my experience, the success of Greek food depends very much on the quality of its ingredients. No amount of fancy dressing will save a Greek salad if the key ingredients: the tomatoes, the cucumber, the olives, and the feta cheese, aren't of good quality. There were no issues with these ingredients at Cafe Kottani - in fact, the tzatziki and pita that was served with my Greek Salad (£7.95) were the best I'd ever tried outside Greece! I also sampled one of the Mini Feta Phyllo Pies (£2.30 each) which was delicious: perfectly flaky pastry with crumbly cheese inside. My boyfriend was pleasantly surprised with his Meze Platter (£8.95) as he's not usually very adventurous with food. The combination of meatballs, gigantes, grilled halloumi, salad, feta and pita on the plate won him over. 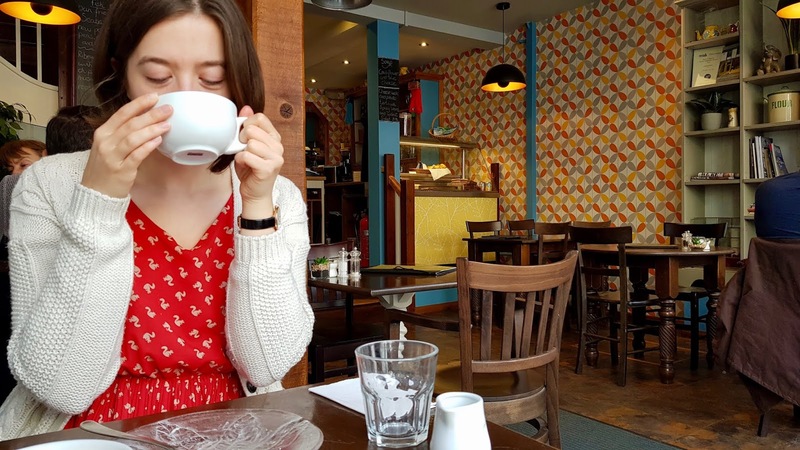 The only slight disappointment about our experience at Cafe Kottani was that we didn't receive the drinks that we ordered until asking again at the end of our meal, but this wouldn't stop me from heading back on my next visit to Bury St Edmunds. I had a great time on my #railadventure and I wouldn't hesitate to recommend a day out by train this Easter. Head over to the Greater Anglia website to book your tickets today! Let me know in the comments below where you last travelled by rail! *The train journey detailed in this post and entry to the CurveMotion skating rink were provided free of charge in exchange for a review.